Twice a month the city of Boulogne-Billancourt, which lies just outside the Paris city limits, hosts an organic farmers’ market. Although you often find organic stands at many Paris-area markets, there are only a few that are fully dedicated to pesticide-free produce. The marché biologique in Boulogne-Billancourt takes place the 1st and 3rd Saturdays of the month from 8:30-4:00pm on the route de la Reine, between rue de l’Ancienne mairie and rue de Silly. This is a market I especially like because of it’s calm, friendly atmosphere and simple, down-to-earth attitude. It’s a small market, with only a dozen or so vendors – and it doesn’t try to be anything else. Despite its small size, this market offers quite a bit of variety: colorful in-season fruits and veggies, high quality cheeses, fresh fruit juices… The vendors (who are among the most welcoming and talkative I’ve come across), take ample time to give recommendations and let curious buyers sample. That’s how I ended up with two kilos (and two types) of string beans! 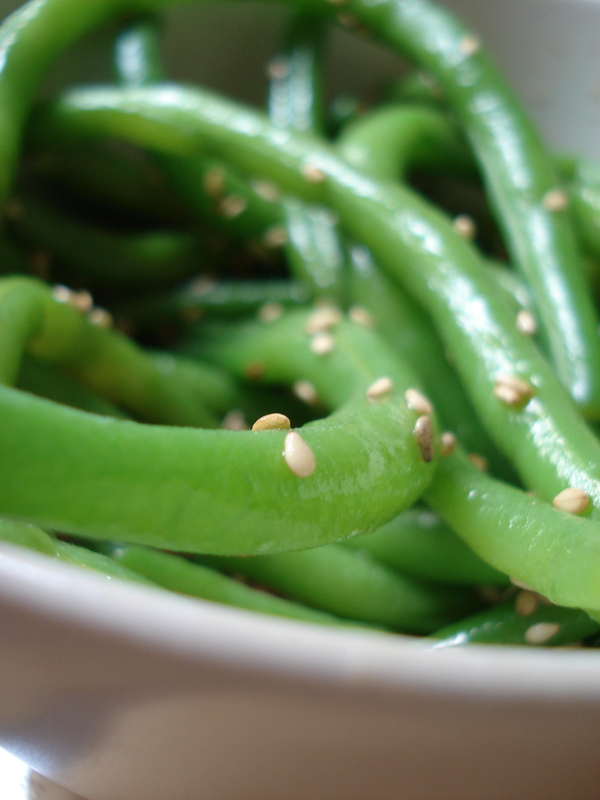 Haricots verts (green beans) and haricots beurre (wax beans) actually make a perfect combination in this Asian-inspired string bean salad – a long-time lunch-time favorite. This is one of those recipes that has no exact measurements, just put each ingredient in to taste. The sesame oil is the secret ingredient, as it adds a nice flavor as well as an enticing smell. 1. Slightly steam the string beans. They should still have a bit of crisp to them. 2. In a saucepan, sauté the garlic in olive oil. Turn off heat. 3. Add the beans to the garlic, as well as a dash of sesame oil (you don’t need much) and some soy sauce. Mix. 4. Transfer to a bowl and sprinkle with sesame seeds. Cover and refrigerate for several hours or overnight. Eat cold. This entry was posted in Paris Food Markets, Recipes (All), Recipes (Vegan) and tagged salads, sides. Bookmark the permalink. Yum! This looks so simple and fresh. I’m going to try it.